...like the best freaking art exhibitions, not to mention culture in general. OK so this show is over as of 5 days ago, but I am still totally into the concept. You see, the ruling office in Italy is like a hallway in a slapstick comedy, with various players good and bad chasing each other in and out of doors, crawl-spaces, and kitchen appliances. Recently the comedy seems on fast-forward, with Prodi deposed, parliament dissolved, and an election at hand. This is manifest especially on the streets, as election posters layer over ads layer over election posters. Above is a poster for an exhibition studying these paper layers of contemporary history...and I think it is brilliant. 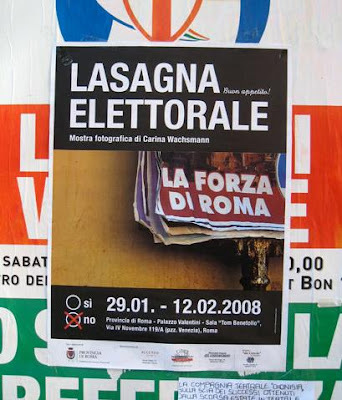 The Italians have all the coolest political drama/poster design/cultural exhibitions.